1 Million for Work Flexibility has more than 100 organizations on board to date as part of our coalition—and counting. We’re pleased to share more information about our supporter Antenna in this Q&A. As a corporate marketer, Brendon Schrader struggled to quickly find specialized talent that could help him solve problems, implement strategies, and move faster. He was in a bind. Big consulting firms and agencies were expensive and focused on large projects, while traditional staffing firms generally provided only junior, inexperienced talent. To solve this problem, Brendon decided to take matters into his own hands. In 2006, he left his job and become an independent consultant, founding Antenna. As his clientele grew, he started building teams and engaging other independent professionals. His plan has worked brilliantly. Minneapolis-based Antenna now features 15 corporate employees and more than 100 consultants who offer a mix of talent that no other company can match. In this Q&A, Brendon talks about the “a-ha” moment that led him to create Antenna, as well as the ongoing impact of flexibility on the company’s growth and development. 1MFWF: You’ve written about the personal “a-ha” moment that led you to create Antenna. Please share that experience and describe how it continues to affect your personal quest for a balanced life. How did that experience affect the way you built Antenna? Antenna: As a young professional, I worked hard to make it up the corporate ladder. I’d worked full-time through college and business school. I’d jumped at every opportunity along the way. And in my late 20s, I found myself exactly where I’d always wanted to be—working as a marketer inside a respected Fortune 100 organization, on the fast track for advancement. But I looked around and saw a lot of cracks in the system. Personally, I wondered if the hard-charging, always-on work environment would be a good fit for me long-term. I saw people in jobs above me who were overworked and underfamilied. I knew I wanted to create something different for myself and my family. The “a-ha” moment came during a vacation with my wife in Switzerland. We’d saved and planned for months, and then I found myself sitting inside my hotel room staring at my laptop instead of enjoying the dream vacation with my wife. Something had to change. I started Antenna to give people a new way to work. I wanted to connect smart, hard-working marketers with interesting, fulfilling work that also made sense for their personal lives. I also saw a huge opportunity to connect marketing organizations with the flexible talent they needed. We’ve built Antenna specifically to solve these challenges. 1MFWF: What kinds of flexible and remote work policies does Antenna have in place for its employees? How have those policies evolved over time? 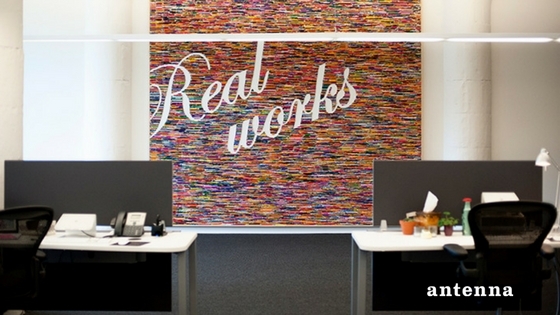 Antenna: We know that people’s work needs and preferences change over time. We help Antenna consultants shift their work obligations in a way that works for them. For example, we have several consultants who work heavy periods for several months in a row, and then take off for a month or two to travel or spend time with family. We have parents who work specific schedules so they can be at home when their kids get off the school bus. The goal is to provide a wide range of client opportunities that support these work scenarios. Flexible work is baked into the business model. For our corporate teams that support our consultants, we have a number of policies designed to provide flexibility to our staff. All of our teams have the option to work from home as needed and are provided the tools and technology needed to do their work remotely. We want people to work smart and be productive. Besides a few weekly standing team meetings that are in the office, people have the freedom to work how and where works best for them. And for most people, that may mean something different each day. We work hard to balance building an internal culture with giving people the flexibility they need to be successful. 1MFWF: Even though your consultants are “free agents,” you provide them with benefits and growth opportunities. How do your consultants feel about these benefits? Why is it important to Antenna’s model? Antenna: Antenna consultants really get the best of both worlds—they get to work on a wide variety of projects and enjoy the flexibility of being independent, but they get support from Antenna that they wouldn’t have on their own. We offer medical, dental, and life insurance, retirement savings benefits, continuing education, and a peer-to-peer online community. Our consultants consistently give us feedback about our benefits and our community focused approach. The goal is to provide consultants with an infrastructure that helps them do contract consulting as a career, without giving up access to things like benefits and learning opportunities. 1MFWF: How would you characterize Antenna’s corporate culture? How do your clients react to that culture? Antenna: At Antenna, our goal is to build community inside and out. Inside our organization, that means supporting each other and helping each other learn and grow as individuals and marketers. As we grow, our culture is evolving, but my goal is to keep culture the top priority. We live by six values: open, true, connected, generous, adventurous, and ambitious. We all work hard to keep them front and center as we grow and go through times of change. And we strive to celebrate these values in each other and our daily work. Outside our walls, we’re passionate about improving the larger community. Recently, we launched the “Antenna Good Works One for One” program. For every hour our consultants work, we provide a meal to someone in need through a local food bank, Second Harvest Heartland and Feeding America. Antenna consultants and staff employees also volunteer together at the food bank every quarter. Our goal is to provide over 100,000 meals to local families in 2016. We have built the company structure to encourage volunteering and giving back. Antenna employees and consultants have the freedom to take time for their passion projects. In 2015, Antenna team members raised money for classrooms in Uganda, volunteered around the world, and founded a local nonprofit that connects professionals with social good projects. Overall, the market and our clients have responded positively to our business and our culture. Antenna was recently recognized with a Best of Business Award by Twin Cities Business Magazine. Best of Business uses peer voting to determine the most appreciated and affirmed companies in Minnesota. 1MFWF: Antenna is still a relatively small business, but it’s growing quickly. What are you doing to position the company for continued expansion in the years to come? How will the company’s commitment to flexibility help it achieve those goals? Antenna: We’re definitely growing fast. We’ve hit double- and triple-digit growth every year since 2012. This summer, we hit 100 consultants, and that number continues to grow. Looking ahead, Antenna will continue to respond to needs in the marketplace by delving deeper into emerging disciplines, including content marketing, analytics, and marketing automation. We’re working on new and innovative products and services that are an extension of our current business. But in the end, our entire business model is built on the idea of offering flexibility to both clients and consultants. And that will never change.